ENSO is an urban winery that hand crafts authentic old-world style wines that express both the moment they were created…as well as the moment they're enjoyed. Many great ventures begin in garages...ours certainly did! But they seldom stay there forever. In our case, our big “garage” in the Buckman neighborhood is our forever home. Welcome to ENSO winery located at 1416 SE Stark Street. We opened our doors Memorial Day weekend of 2011 and now we’re open seven days a week! When we began this venture called ENSO, we decided that it made the most sense to keep things small, efficient and manageable. That way, we could create fantastic wines at lower costs and give more attention to each small lot. Even as we grow, we keep our vision in mind. We keep things as small-scale as possible: Human-sized stainless steel tanks, small fermentation bins, and no-bigger-than-we-need crush equipment. This allows us to experiment, to care for each batch separately, and to create complexity in our small space. We have chosen to source grapes from the finest vineyards up and down the west coast. Three states. All states that we have lived in. And all states that we love. Our grapes come from Washington, California, and Oregon – and we absolutely love each vineyard that we work with. At ENSO, in addition to our wines, we keep a rotating tap of other Portland-made wines and local beers. There is plenty to taste and try in our Tasting Lounge. We have Aperitivo (aka Happy Hour) from 4-6 pm Monday-Friday where we offer all of our drinks and combo boards at a dollar off. So enjoy. We have chosen to source grapes from the finest vineyards up and down the west coast. Three states. All states that we have lived in. And all states that we love. Our grapes come from Washington, California and Oregon – and we absolutely love each vineyard that we work with. This is where we get most of our red grapes from. These 15-year-old vines are just bursting with life! Located on the Columbia River, on the Southern border of Washington state, Alder Ridge has been regarded as one of the finest vineyard sites in the entire state. Natural wind and air drainage protects the vines from the harsh weather conditions, both in the summer and winter. Reminiscent of the Rhone slopes, the vineyard grows some of our favorite varietals. We pick Zinfandel, Petite Sirah, Counoise, Malbec, Cabernet Franc and Grenache from this vineyard. Rich earth producing world-class fruit. Mourvèdre is our flagship grape. And we get old-vine stuff. The vines are still quite full of life, but they're pumping with wisdom of years passed. This grape (which is commonly blended with Syrah and Grenache) makes a meaty, gamey wine. Dark fruit and musky spiciness make for an exquisite gastronomic experience when paired with worldly meats and cheeses. For us though, we like to keep our Mourvèdre generally unblended. And this vineyard is a perfect site for a varietal like Mourvèdre. At 1200 ft, good slopes and warm summers seem to bring about an almost Bandol-like wine...which is what we were going for! Our old backyard, we get Pinot Gris, Riesling and sometimes Pinot Noir from the vineyard attached to Arcane Cellars. Situated along the banks of the Willamette River, this macro-climate delivers the perfect amount of sun and warmth to get these varieties to ripen. No more, no less. Which makes for remarkable wines. We make a very special wine from fruit from this vineyard. It's called The Prince and it's a co-fermentation of 75% Pinot Noir and 25% Chardonnay. Unlike anything you've ever tried! While we don't currently source from this vineyard, the fruit is exceptional and you can find their own brand of wine at FOSSIL & FAWN. ENSO Winery began as a collaborative effort between passionate winemakers and grew into Ryan Sharp's urban winery. Ryan began as a winery grunt at Arcane Cellars on the banks of the Willamette River. While Ryan fell more in love with winemaking, he also dreamed of leaving the valley to make wine in Portland, where he has resided since 2008. After assisting John Grochau a few times, he fell in love with the idea of an urban winery. A place in the city, in a neighborhood, a local watering hole, a place to meet friends, and a place to produce world-class wine. After moving to Portland from San Francisco, he transferred from UC Davis to Chemeketa to get a more focused education...one dealing more specifically with NorthWest climates and grapes. He started home winemaking several years back. When not stirring up fermenting wine vats or bottling the latest vintages, you'll find him hunting down exotic wines from Bandol. 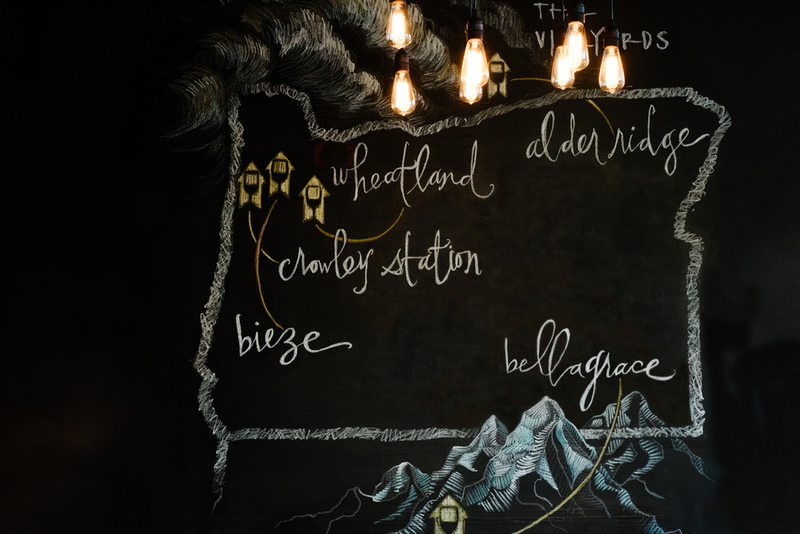 Willamette Week’s Bar of the Year in 2014.